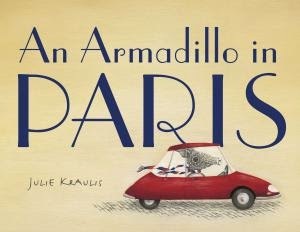 The picture book, An Armadillo in Paris by Julie Kraulis, is Tundra Books Reading Club's pick for the month of February. I was delighted to receive a free copy in the mail along with beautiful postcards and a reading guide. First off, if you are like me who likes to scan through all the illustrations before reading a picture book, I'd recommend not doing it on this one or maybe stop before the last few pages. Part of the appeal of this book is the underlying mystery of who the Iron Lady is. Clues to her identity are peppered along the pages and there is a whole two page spread at the end for the great reveal. I think it's more fun to go in not knowing who she is and then re-reading it afterwards for further scrutiny. Arlo's adventures in Paris included a visit to Arc De Triomphe, Cafe Gustave, Champs-Elysees, a local patisserie, the Louvre, the Seine, a bookstore in Rive Gauche, the Luxembourg Gardens and the Iron Lady of course. That is a lot of new places packed up in one book (and a mouthful of French words I had to learn to pronounce correctly)! I liked the fact page at the very end of the book which gave more details of the places Arlo had visited. It added a sense of history and authenticity to the story. 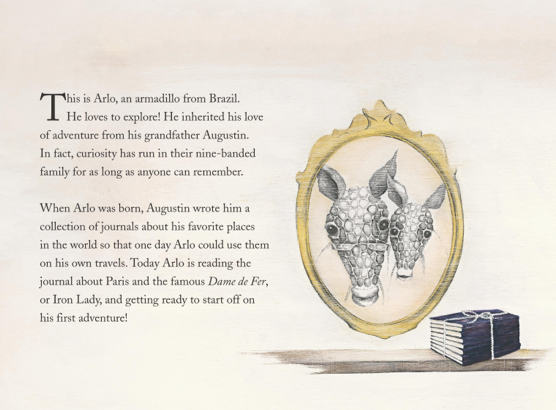 The story is told with each page containing a journal entry written by Arlo's grandfather (Augustine) and then just below it are Arlo's experience and thoughts of the same place. In a way, I am getting two perspectives for each adventure - an older and a younger one's. Augustine's presence, expressed through his journal entries, gives direction and assurance to young Arlo as he moves onwards on what would otherwise be a very lonely and possibly scary adventure for this solo traveller. Aside from Augustine, whose picture we only get to see on the first page and the Iron Lady, whom Arlo still have to meet at the last page, the only other fellow traveller who shares Arlo's adventures in between is the reader herself/himself. Having Augustine's voice tag along feels comforting. The illustrations in the book are delightful and are all done by the author. 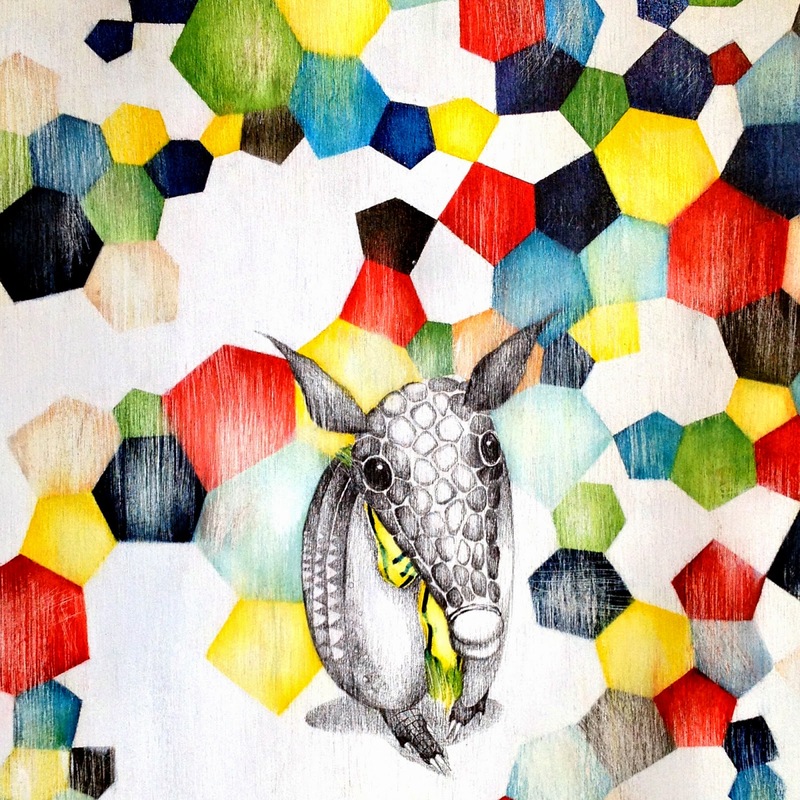 Further googling Julie Kraulis revealed she is a freelance artist and illustrator. Her illustration style lends nicely to the picture book. It has a light feel to it with rich textures and delicate details done in graphite pencil. 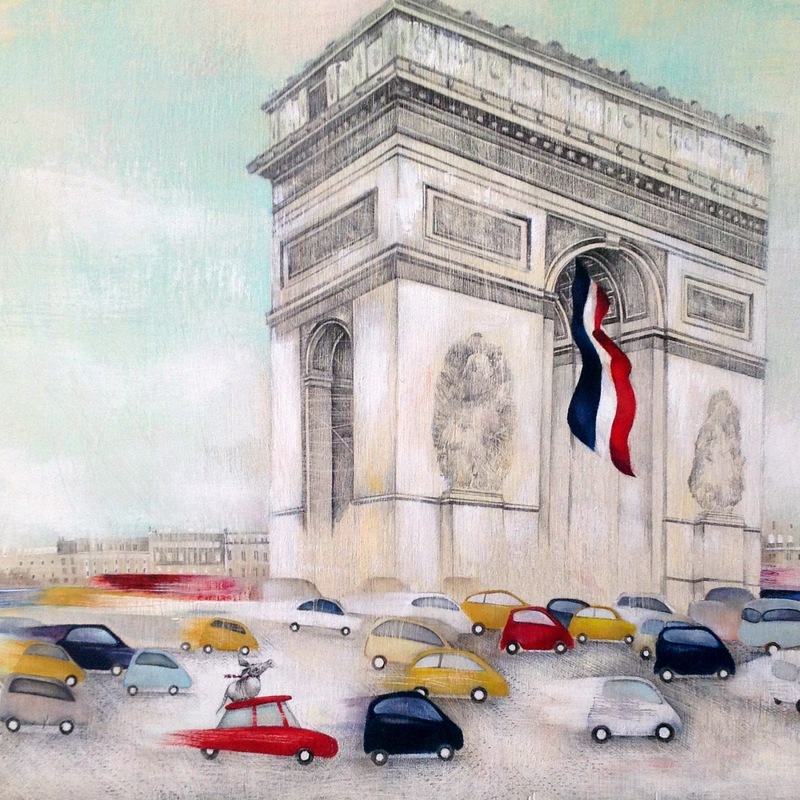 She uses a limited colour palette mainly based on France's tricolor flag with shades of ochre and light blue added. The effect gives a certain sophistication much like what one would associate with Paris. I love the texture of the graphite. It seems like the use of graphite pencils with touches of color added through digital colouring or over layers of watercolour, gouache, or oil in this case is becoming a popular picture book illustration style. Artists who use similar techniques include Isabelle Arsenault and Beatrice Alemagna. I would have preferred to see a bit more facial expression reflected on Arlo's face. With the absence of a mouth, it's a bit challenging to discern what he is feeling without reading the text. However, this is a matter of preference. Jon Klassen for one, doesn't like to show facial expressions on his picture book characters and draws them with no visible mouths. I must say, Arlo's eyes are very adorable. Just look at him! One thing I found curious is the absence of a map illustration. Given that this is a travel adventure picture book, a simple map illustration stuck somewhere as a visual reference on where those places are relative to each other would have been helpful. All in all, I find the book quite an enjoyable read and pretty educational too. For someone who dreams of visiting Paris someday (and who doesn't? ), reading the book felt like a mini-adventure prelude to the real thing. Arlo is certainly an interesting companion to travel with. And it looks like we would be seeing him in some more adventures in the future, judging from the pile of grandpa Augustine's journals on the shelf. Hmmm...I wonder where he would be off to next. Thank you Tundra Books, for giving me the opportunity to review the book. All illustrations on this post are by Julie Kraulis.